famous in some way or another. REX the star horse in old western movies. 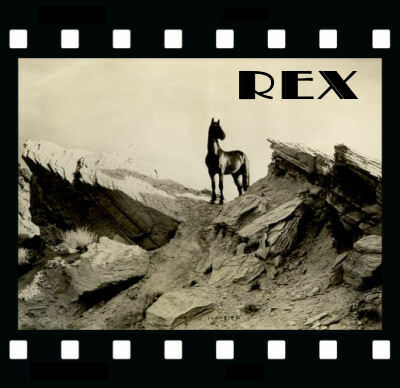 The picture of Rex looks to be at Vasquez Rocks in Agua Dulce, California (earthquake shifting area) History from 1932- Earl Haley, owner of movie horse Rex, a black stallion and Lady, a white mare, acquired a young buckskin called Marque. Haley took the 3 horses to Arizona his native state and made a picture call "Wild Horse Stampede" for Columbia studio. The 2 horses Rex and Marque had a few brawls so they were kept far apart. The 2 stallions were fighting was over Lady. 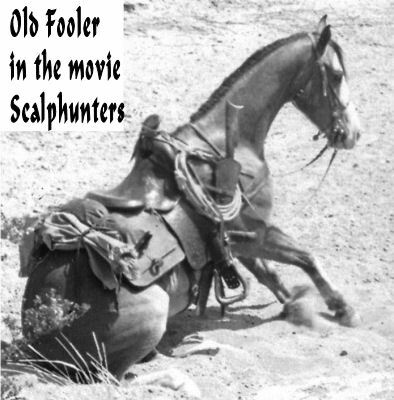 The horses worked on the movie together under watchful eyes of cowboys to keep them from hurting one another. Haley explained that Lady still is infatuated with Rex, but that she used the younger Marque to make Rex jealous. Think it worked. A wise Lady mare. Typical hollywood triangle. 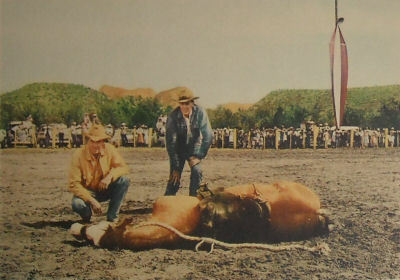 Charlies Surprise lived at a ranch and used as a cowhorse for roping and gathering cattle, nicknamed Beechnut after a brand of chewing tobacco. 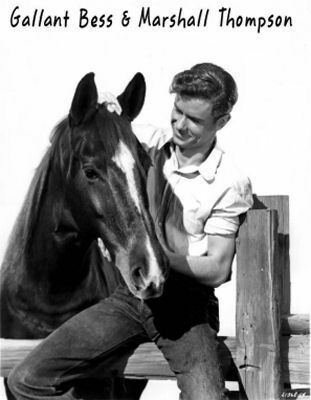 This horse worked in movies, after movie wrangler Jack Lilley owned him. 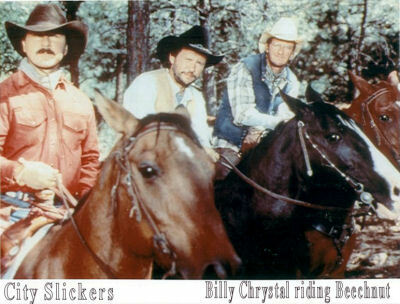 "City Slickers" is where actor Billy Crystal was paired with this black gelding. 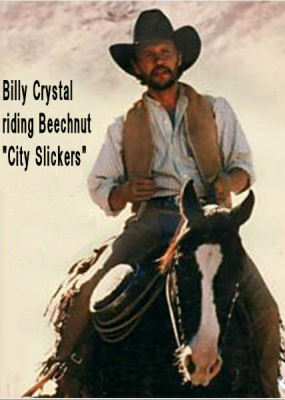 Billy was so impressed with Beechnut that Jack Lilley let him buy Beechnut after filming was done. Billy so fond of this horse, he remarked riding Beechie is like driving a Porche. During the last movie"City Slickers II" Beechnut's blaze was disguised with dies Jack Lilley's wife happens to be a cousin to my dear friends of many years of Saugus - Canyon Country, California. 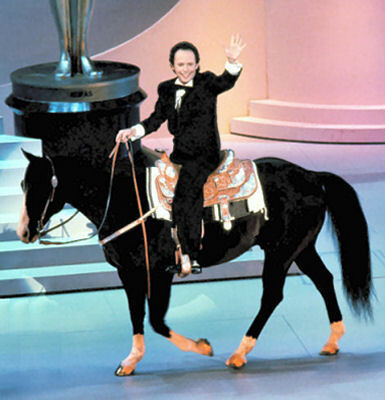 Many actors wanted to own the horse they rode in films from the Lilley ranch.The only other appearance made together was when Billy rode Beechie onto the stage of the 63rd Academy Awards show in 1991 in honor of the movie winner, "Dances With Wolves". No rehearsal needed for Beechie's appearance. Beechnut was retired to a stable where Billy could visit and ride him. When Beechie became too old to ride, Billy would lie in the pasture and read a book to Beechie. He'd come up to Billy and look over his shoulder. Sad news came to Billy that Beechie was down and not doing well while he was away in Canada. It was an incurable liver infection. A few hours later, Billy sadly had to have Beechie euthanized. No more suffering November 2008 .. Beechnut was 27 years old. 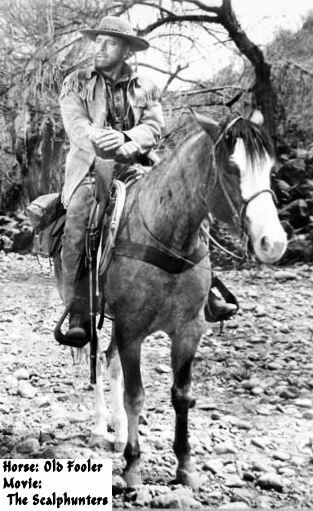 Hightower, was owned by movie wrangler and horse trainer Rex Peterson of Tehachapi, California. Hightower's most prominent roles were as Pilgrim in "The Horse Whisperer,"Ginger in "Black Beauty,"and Julia Roberts' getaway horse in "Runaway Bride". Peterson retired him after filming "Princess Diaries II". Hightower was an unregistered Thoroughbred. He was never registered by the ranch that Peterson aquired him. Bred from a Thoroughbred stallion out of a Quarter Horse mare (even though Thoroughbred-Quarter Horse crosses are allowed in the AQHA registry). 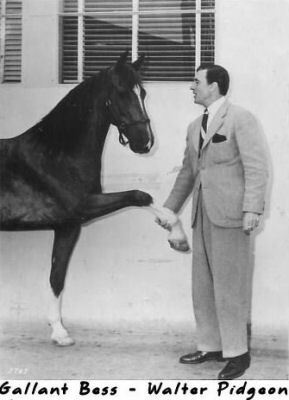 Peterson aquired Hightower (a 2 year old) and trained him as his ranch horse. A couple of months later, Rex got a call from a movie production company that needed a wrangler and a horse. The sorrel gelding took the test and won the job. Perfection came after each movie Hightower worked 24 years, did everything without argument that Peterson asked of him. Petrine Mitchum had contacted Horse Fame gathering leads for information for a possible documentary movie that ended up as her book "Hollywood Hoofbeats" she related to me in July 2000 that she met Rex Peterson and had gotten to ride Hightower and was very impressed. Her words: "Today I went riding with Rex Peterson, the current #1 movie horse trainer who was Glenn Randall's protoge. What a great experience. 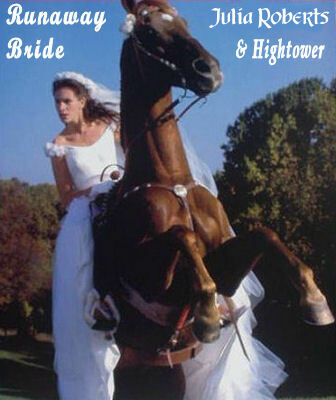 I rode Hightower, his most famous horse, straight up the highest mountain I've ever ridden." Hightower died of natural causes and was found laying in the pasture in California October 30, 2008, at the age of 26. (below) Old Fooler, star of The Rounders. V. J. Stacy had Old Fooler and broke him before Jack Lilley bought him. The roan who acted like a sleepy head and then did fantastic bucking. He reared, fought and would lay down, and played dead, paced down the road as a gentle saddle horse. On his first saddle he bucked Lilley off . After the Rounders movie. Old Fooler was bought and sold through several movies. Denny Allen was Old Foolers last owner untill this bright horse retired at the age of 34. He had to be put down because of his old age & poor health. Jack Lilley's son, Clint, respectfully saw that it was done caringly. BESS starred in the movie "Gallant Bess" with actor Marshall Thompson in 1946.